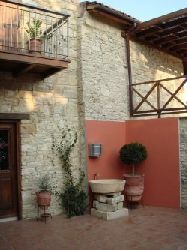 We believe the location and the main structure of the house is over 800 years old. In the 1920�s until 1960�s the house was partly used as barber shop by Yiorgos (George the barber). The house was purchased by the present owners in 2004 in derelict condition and was painfully and systematically restored to its present condition with the use of traditional and original materials. 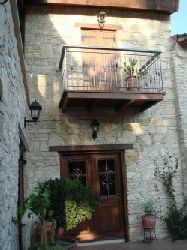 It is now recognised that the house is one of the best examples of restoration within the region of Limassol. The property is approach through a traditional wooden gate into a secluded garden. The main entrance leads into an open plan sitting room with the original fire place, ideal for relaxing on cooler winter evenings. The kitchen and dining room are approached either externally from the courtyard or internally through the sitting room. 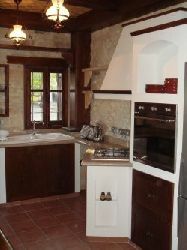 The kitchen furniture has been traditionally designed while using modern appliances and a granite top. Throughout the ground floor ceiling is supported by beams and traditional covering. A wooden/metal staircase leads into the sleeping quarters on the first floor and attic. The first floor offers 2 comfortable double bedrooms, having handmade pine built-in wardrobes. Both bedrooms are serviced by a bathroom and a WC (shower). The bedrooms have balcony and patio areas. The main patio is large enough to accommodate comfortable seating and dining and overlooks the village centre and the village church. The attic is approached by a spiral staircase and offers comfortable accommodation of a walk-in wardrobe and en-suite shower and WC. The attic bedroom offers 2 single beds with a skylight for stargazing. The property has been furnished to an extremely high standard throughout. Established over 2,600 years ago, the village and its immediate area is well known for its antiquities and rich history. Silikou and the immediate area is recognised as one of the most ancient areas of wine producing throughout the Middle East, hence the large number of micro wineries that can be found within this region. The location of the village and its altitude at 1,700 ft offers a unique micro climate of pollution free clear air and the cool breezes relieve the heat at the height of the summer. It is accepted by the locals that the winter and spring seasons are more enjoyable than the summer period. 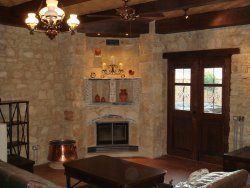 If you are looking for a tranquil relaxing holiday and you love nature, the village offers a direct encounter with typical village Cypriot life unchanged over the centuries, scenic walks and paths which lead into the surrounding villages, historic churches and monasteries, local wineries and nature trails.